Is Netflix Hated Enough To Inspire A “Netflix Killer”? Many have threatened to leave Netflix. But do they have anywhere to go? Supposed “Netflix killers” in the space are going after its customers–even if they offer very different services, and in certain instances, more expensive prices. Many have threatened to leave. But is their Netflix aversion strong enough to transform the brand into a recruiting tool for its competitors? Even when these supposed alternatives to Netflix offer very different services that are, in some cases, more expensive than the prices that led them to ditch Netflix in the first place? At the height of Netflix’s price hike hoopla, for example, Blockbuster swooped in to give disappointed Netflix customers a free 30-day trial and a discounted subscription plan. Now, Blockbuster.com has been dramatically redesigned as a Netflix attack-hub. “Looking to make the switch to Blockbuster? Tell Netflix why,” the site’s front page reads, with an option to post your thoughts publicly under the hashtag “#HelloBlockbuster.” A bold banner on the right begs “Netflix customers” who are “seeing red” to make the switch to Blockbuster. Of course, there are benefits to Blockbuster’s subscription service: access to in-store exchanges, video games, and many new releases that Netflix subscribers would have to wait 28 days for. But, fundamentally, the two companies have different business models. As Blockbuster CEO Jim Keyes has said, Blockbuster is more focused on new releases and physical DVDs, while Netflix is more focused on longer-tail content and subscription-based streaming. Walmart, too, has gone after Netflix customers, without a Netflix-style service. If you’d read any number of media reports, you’d believe Vudu, Walmart’s streaming service that launched on the iPad last week, is yet another Netflix killer. 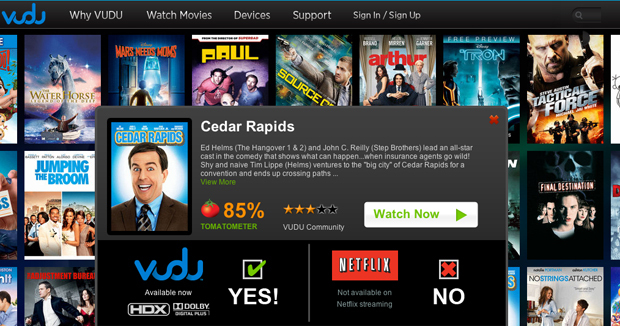 But Vudu is a VOD or video-on-demand service. Similar to Blockbuster’s streaming offering, movies are available online to rent or to purchase. “It’s an à la carte service,” as Vudu GM Edward Lichty says. It offers an entirely different service than Netflix and has an entirely different business model. Like iTunes, Vudu does not offer unlimited online streaming for a monthly subscription rate, and it does not offer DVDs by mail. But on Vudu, every film clicked has a large advertisement attacking Netflix. Lichty adds that he doesn’t suspect the 28-day delay to have had much of an impact on Netflix. “I certainly know they’ve been growing like crazy since that was put in place, so it doesn’t appear to have hurt them,” he says. The media is just as guilty for drawing such comparisons. Plenty of alleged “Netflix competitors” are often branded potential “Netflix killers.” Hulu Plus? A Netflix killer, despite the fact that it mainly offers streaming television shows. Amazon Instant? Another potential Netflix killer, despite the fact that it’s a VOD service that also offers subscription streaming, with a fraction of the titles that Netflix has, and unrelated benefits such as free two-day shipping. Redbox? A kiosk-based DVD provider that rents on a per-day basis. HBO Go or Comcast Xfinity? Only provides HBO or Comcast-provided content, respectively, and only with a TV subscription with HBO or Comcast, which is more expensive than any comparative plan from Netflix. So why attack Netflix? Branding. Marketing. It’s no different than when Apple went after Microsoft when Microsoft was Microsoft; it’s no different than how most every team in the MLB hates the New York Yankees. You need a Darth Vader-like figure ruling an empire in order to seed a rebellion. Could there be a “Netflix killer” in the future? Sure, if any competitors actually launch the subscription streaming services they’ve long been rumored to be building. But for now, the only Netflix killers out there are in the movies and TV shows that Netflix offers.